schools, hospitals, hotels, industry, general businesses and now fundraising. In a world of fundraising opportunities, looking beyond candy sales and pizza kits gives you an opportunity not only to fund your teams and clubs, but also a chance to save the world. 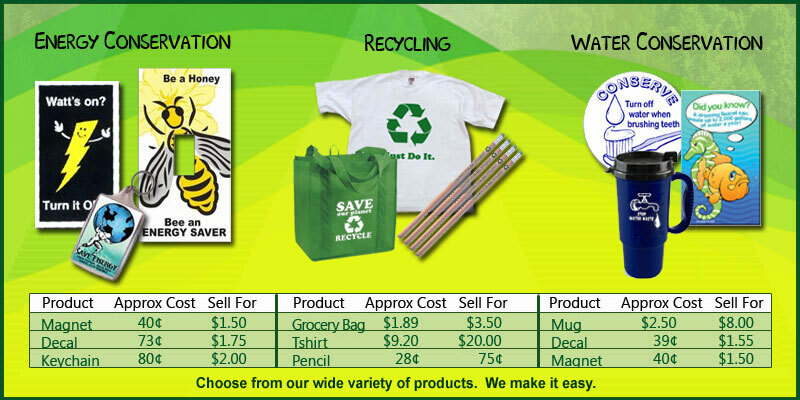 AwarenessIDEAS offers thousands of products to promote energy conservation, recycling and other environmental causes. These products are offered to school organizations for resale as part of a fundraising program that works. How easy is it to get involved? Easy as 1-2-3! We will work with you to choose products that fit a theme and price goal. We will create order sheets to present the products to your students and parents, along with retail pricing. Sheets will have areas to indicate selections, quantities, costs and total of each order. We offer a variety of products to fit the needs and interest of any fundraising effort. These include magnets, pens and pencils, handouts, key chains, mugs & cups, decals, t-shirts, calendars and a whole lot more. We can put together packages that include quantites of 100 / 250 / 500 / 1000 of chosen products. We recommend you keep it manageable; you can always order more. Keep in mind, the more you buy of each product, the lower your cost becomes. The choice is yours. We have a unique referral program that generates on-going fundraising income. Schools who get excited about our environmentally themed website products and their potential can choose to participate in our referral program. Under this program, your school introduces our website to parents, who can refer the businesses they work for or own to our website. We already work with thousands of businesses who find our awareness materials to be invaluable in cutting costs and spreading awareness. Now we’re taking it a step further to help schools that need our support. Any school that wishes to participate in our Adopt-A-School Program can enroll by calling or emailing us for a form. Once the form is submitted, the school is assigned a coupon code that can be given out to the parents of students, local businesses and anyone else who might benefit from our products. For every purchase made with your school’s coupon code, 4% of the net sale is donated to the school to buy books, equipment, supplies or anything else the school needs. If the school buys materials direct from us, the donation is raised to 7% credit toward the purchase of awareness products they need for their own district. Either way, your school benefits!